Photo by Ross Zentner, set and lighting design by Jason Fassl. 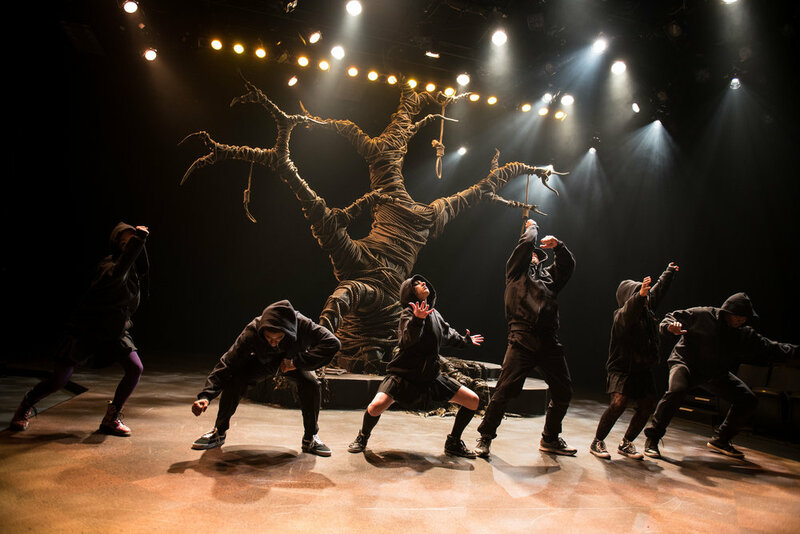 When you walk in to Next Act’s theater to see Dominique Morisseau’s moving ensemble piece “Blood at the Root,” the first thing you see is the tree. Enormous and gnarled, devoid of leaves, each of its branches comes to a sharp, menacing point. Created by scenic designer Jason Fassl, the trunk’s significant girth denotes the tree’s age. Its sprawling roots, which bulge above the earth like many grasping hands, are firmly entrenched in the ground. Where there should be bark, there is rope, wrapped tightly around every limb in criss-cross patterns. Stark and foreboding, the tree is seemingly both restrained and strengthened by the layers of cord woven around it. There is a sense that it has existed for centuries and will outlive all the audience members and the teenagers that gather around it over the course of the 90-minute choreopoem. As easy as it is to label this menacing Southern tree a symbol that could “bear strange fruit,” it is also literal — a large tree was an important part of the news story that “Blood at the Root” is based on. Told from the points of view of six high school students, the play is inspired by outbursts of racial tension in the tiny town of Jena, Louisiana, in 2006. On an uncharacteristically hot October day a few black students decided to sit under a tree outside their high school that was normally the territory of white students. The next day nooses appeared, hanging from the branches. This prompted a demonstration on campus, and later a white student was beaten to unconsciousness by six black students. While the nooses were dismissed by school and local authorities as a prank, the “Jena 6” black teens were formally charged with battery; one was eventually convicted and the others pleaded no contest. Smacking of systemic racial injustice, these events sparked protests and outrage on a national scale. When Dominique Morisseau approached this material, it was a part of a three-year residency at Penn State. She worked with a group of MFA actors to create a theater piece specifically for them to perform, nationally and internationally. A combination of conversations with the teen and twenty-something student actors and reactions to the episode in Jena resulted in this uniquely resonant examination of profound racial problems simmering just below the surface in this country. The script feels both poetic and achingly authentic — seldom have teenage voices been captured so accurately for the stage. And similar to the docudrama work of Anna Deavere Smith (“Twilight Los Angeles, 1992,” produced by Next Act in 2016) and Dael Orlandersmith (“Until the Flood,” presented by the Milwaukee Rep in 2018) “Blood at the Root” doesn’t pretend to solve the problem it addresses. Instead the production — part dance, part rap, part monologue, part intricate two person scenes — examines a flashpoint at the intersection of fear, hatred, and learned prejudices, from many, many perspectives. Whatever you think about what happened in Jena, Louisiana, when you walk in the door, the production will challenge and complicate those assumptions, bringing the problem into stark relief but painting both the attacked and the attackers in many subtle shades of gray. The tight knit ensemble is led by Chantae Miller as Raylynn, herself a bundle of contradictions. A star student who wants to be class president, she follows her late mother’s advice to stand up to those who would demean her. According to her mom, apathy is a much greater sin than getting into a noble fight and Raylynn is far from apathetic. The smallest and youngest member of the cast, Miller’s wide eyes take in everything and her natural confidence fits her take-charge character. Open and eager for change, she reaches out to a new student, organizes a campus protest and tries to broker peace between opposing forces. Miller’s youthful optimism and energy are delightful to watch, and they make her moments of disconnect -- when her character can’t sympathize with others -- more stark. Raylynn announces at the top of the show that she’s going to break some rules that determine who can sit where, and who can run for student council. But later, Raylynn’s brother De’Andre (a strong Justin Lee) laments in a heart wrenching rap that he was arrested because he forgot the unwritten rules about young black men dealing with the police. While these might sound like stories you’ve heard before, they’re not. They are complicated by Rylynn’s best friend Asha (a dynamite April Paul) who is white, but tries desperately to fit in with the black students after forming a bond with her black stepmother. And Justin (a reserved Ibraheem Farmer), the editor of the school paper who is a smart and studious introvert. He is hesitant to get involved in the controversies about race at school because he has been told that he doesn’t fit with either culture. And Colin (the extraordinary Casey Hoekstra) the white football player who has recently transferred to the school from South Carolina. An outsider in so many ways, he is thrust into the foreground of the controversial incidents after a fight in the cafeteria. Emotionally and physically hurt, he also feels that he doesn’t belong and doesn’t want to take a side. From the way Hoekstra plays with the brim of his baseball cap, to the volumes he pours into his many monosyllabic lines, the actor gives many jagged layers to his character. Perhaps the most powerful moment in the show comes when Hoekstra and Lee are captured in hot spotlights, trying to explain their sides of an altercation to the police. Their almost identical lines show two desperate young men with more in common than most would ever imagine. Director Marti Gobel does an extraordinary job shaping the play and allowing each character to have their moment. Through imaginative staging that keeps the cast onstage for most of the show, she fills in a lot of the blanks in the story -- showing the students in a civics classroom, in the hallways, throwing a football around and killing time between periods. She also keeps the adults at bay -- they are disembodied voices or teachers, coaches and parents who are described and not always respected. The fact that the story comes only from teens makes it fresh, and hearing them ask the essential questions of how this hatred was planted, how long it has been going on and how they can stop it is staggering. Much like she did in directing “The Brothers Size” at Milwaukee Chamber Theatre last year, Gobel excels here in her use of percussion, movement, stomp dance and playful approaches to language so the performance transcends realism and becomes something more lyrical and ritualistic. Alicia Rice’s choreography also adds to the magical storytelling quality of the piece. In this divided era of taking sides, I would not encourage audiences to see this incredible show once, but to see it a few times so you can literally see it from every angle.